Welcome to Trico Dock Center, your locally owned and operated Dock Builder, servicing the Lake of the Ozarks region for over 40 years. We specialize in Heavy Duty Docks, New & Used Docks, Dock Modifications, New Poly Lift Boat Lifts and New Econo Lift Boat hoists. At Trico Dock Center we are your source for everything pertaining to docks at the lake. Call 573-348-2737 for more information on keeping your boat high and dry in your dock. 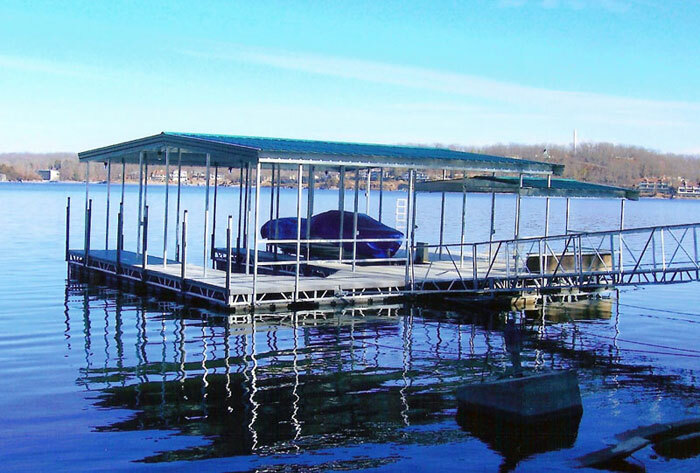 We build docks to suit your needs, including Dock Additions, Dock Repairs and also modifications to your existing dock. Stop by and talk to our experienced dock builders abour what we can do for you! Check out our new selection of Wet Steps! Wet Steps are all aluminum lightweight ladders that make it easier to walk in and out of the water and lift out for dry storage. We have four-step, five-step, and six-step available. Stop by our showroom for more information and pricing!